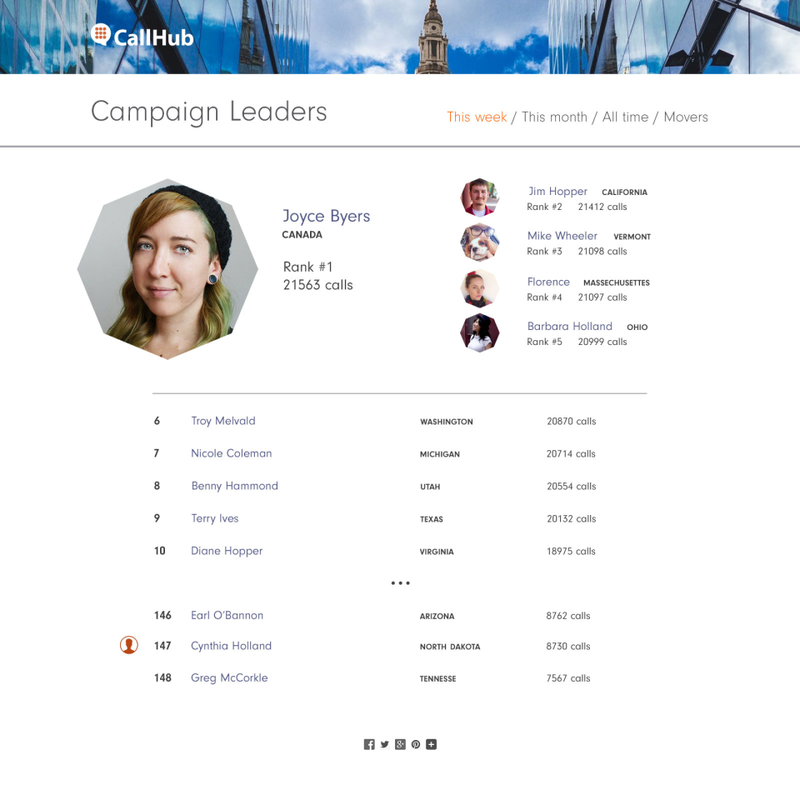 Non-profit orgs, Sales teams for businesses, Political and Advocacy Campaigns use CallHub. It is the only telephony software for campaigns that smoothly integrates with your CRM. CallHub pricing is pay as you go. We DO NOT charge a monthly subscription . Easy to use outbound call center software with automated dialers to suit your needs. Unlimited agent accounts and pay as you pricing. CallHub is a sophisticated outreach software for the biggest businesses, yet simple enough for your organization. 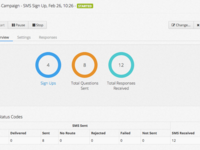 The only solution that smoothly integrates with your CRM. Use predictive dialer, power, preview or manual dialer depending on your requirement. CallHub also provides voice and text broadcasting. 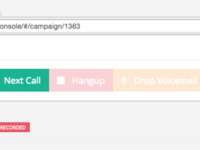 Pros: As someone who has managed and worked on a lot of campaigns and use NationBuilder as my primary database/website solution (which CallHub integrates beautifully with), CallHub has become my go-to platform for affordable phone canvassing campaigns, voice broadcasts and text message blasts. In particular, text message blasts are the single most useful tool for volunteer mobilization that I have used in recent years. Cons: While CallHub works without a hitch at least 99% of the time, occasionally I or my call agents still run into unexplainable bugs that can temporarily bring campaigns to a halt. That is of course frustrating for both volunteers and for campaign organizers, especially in the high-pressure context of a campaign where every minute of delay can mean one less contact with a voter. Overall: Overall, I have continued to use CallHub for several years and have appreciated the improvements I have seen over this time. I find the SMS Broadcast feature is an invaluable way to mobilize volunteers during a campaign, as it allows me to reach dozens of people at once in a way that gets far higher response than email, and allows me to carry on two-way communication with them. I have also used CallHub to run phone campaigns during elections for voter outreach and Get Out the Vote (GOTV) efforts, and between elections to invite people to events. I have also used the Voice Broadcast feature in various ways, from inviting people to events to, in one case, contacting almost every household in a small province to generate leads for people wanting more information about a plebiscite that was taking place. Pros: Ease of campaign set up and sending. Cons: I haven't located the feature that permits me to download all at one time the responses that were positive after sending out a campaign. That functionality will enable me to at-a-glance quickly connect with those that are interested. Thank you so much for the review. It means a lot. We've taken your feedback to the engineering team. Pros: I am able to reach and respond to my clients that answer their phone which saves me soooooomuch time dialing out to them one by one. Cons: The least thing I liked about the software is the phone numbers I rent doesn't tell me if they are expired or not. Overall: My experience with Call Hub overall is a very positive one and will continue to use it consistently. It raises my bottom line cash flow. Invest a little but the return is much more. Pros: Call Hub is the best and fastest when is comes to contacting their customer care. All my problems when using them have been solved in record speed. Very helpful, when making a lot of calls. I have never made so many calls in my life, nor would that have been possible without the help of Call Hub! Cons: Only wish that some of the glitches, which are rare, did not happen like when you are making a call and the page on the screen has not turned yet. Then again, it could just be my internet speed. Pros: Call Hub has the best customer service. They are quick either by email or by the chat box feature. I usually received a reply within a few hours. Very professional. Cons: I wish that there was an option, when more that one state is added into the system that they can keep it all in order, when uploading the file. For example, if I have a call sheet with names from VA, MI, and CA, I have it in order in my excel, but Call Hub randomly mixes it up, so I end up jumping around. It would be great to see this fixed. Overall: Overall, I am very happy with Call Hub and we are continuing to use this for all our outreach. God bless! Pros: The collective texting is a very powerful tool and fairly unique in the market. The calling features are fairly intuitive, and once you figure it out, many calls can be sent easily. Cons: The customer service is easily the worst part about Callhub. The team tries, and fails, to provide rapid, responsive, and effective customer service. Their front line agents do not have the technical capacity to fix most problems. Overall: When call hub works, it works well and it delivers results. When it doesn't work, it can be a hair pulling process with long wait times and many "we'll add that to the development list" type answers. Pros: Easy to use and works well with our business requirement, we are medium size company. It integrates everything nicely and user friendly. Cons: Calling through laptop could be improved, sometimes it works but other times it does not. Also calling is not smooth, there are delays and some disturbance. Pros: We use Callhub for multiple processes in 9ur dual sided marketplace and it makes the process easy and smooth to be able to reach out and track campaign success. Cons: The ability to have interaction and dialogue via texts so far seems limited after the initial reach out. Pros: Very easy to use. I compared to several other services and am very happy that we have chosen to do business with them. Cons: No comments on this. I am happy. Overall: If I could give the customer support more than 5 stars I would. The team is so friendly, easy to work with and assists wherever they can. It is a joy to work with them. Pros: One of the thing that I love with CallHub is the unlimited agent options: they do not place any limits on how many agent accounts can be set up. This greatly optimized our communication campaigns, leading to meeting our goals at 115%. Cons: Sometimes, when we try to open CallHub, it doe not open instantly. But nothing more to worry about. Overall: CallHub is the best solutions I have used up to now for my communication campaigns. I will keep using and do recommend strongly! Pros: Ease of use and customer support. Call clarity is of uptmost importance to us. Cons: Slight delay in contact with customer support. This is due to time xone difference. Overall: Very positive and affordable. Pros: Very straightforward setup and execution. Tested text service to test group and all worked as designed. Next test will include voice and email. Cons: Not sure about ability to upload large volume of records in csv format into a relational database to create and save queries on CallHub. Could create queries off-line and upload csv files for each Group to CallHub but not sure about CallHub storage capacity. Want to contact about 2,000 people at the same time. Overall: Sherwood Firewise Communities is a group of about 2,000 homes and 5,000 people. We are testing the CallHub service and so far sent a text notification to a small group with success and relative ease of setup. Next step is to determine capability of volume service and method to program notification list as well as templates for incident reports. Pros: Very easy to use and also affordable and a all in one marketing tool . Overall: Call hub managed to make this marketing program easy and also affordable . 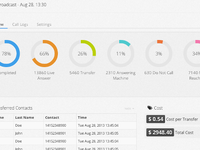 I love this dialer , sms marketing program and robo dialer the team of Call Hub did a wonderful job !! Thank you Wendy! We've shared your feedback with our product team. Pros: The capability to have a truly mobile business with agents working from and environment they prefer. Hi Richard, thank you for your feedback. If you had let us know the issues with quality earlier we could've moved to you different routes. Unfortunately due to the limited customers from your country, we couldn't anticipate it. We will change your routes and this issue of quality you face should be resolved. Pros: Callhub makes it very easy to get up and running with a calling campaign. I find the integration with Nationbuilder to be extremely useful. Cons: Callhub failed when I needed it the most. In the middle of a campaign it took more than 20 minutes to connect a call or wouldn't connect at all. The issues persisted enough that we had to abandon using Callhub for our campaign. When I tried to troubleshoot the issue with their support team it took days to hear back from them. 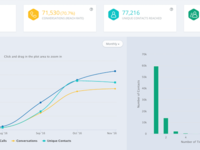 Overall: I find that Callhub makes it easier to manage phone call campaigns and to get data back into our database, and it does so at a much more affordable rate than what I'd be paying otherwise. However my experience with them thus far has been hit or miss. I am actively researching competing options. Pros: It's user friendly and incredibly affordable, we like being able to pay as you go, a huge plus!!!! This is an option few SMS providers allow, usually they make you buy thousands of dollars worth up front or charge a large monthly fee. Cons: The only thing we would like to be able to do is set up SMS campaigns 1 week at a time vs having 1 campaign at a time each day. Overall: We love it all so far, it has done pretty much exactly what we need and has had very few issues ever since we started using it. Recommendations to other buyers: Nope! Pros: Very efficient product with many features. Cons: Not user friendly and it would be ideal to have instant customer support, especially when you are in the middle of a campaign and need results. Overall: Overall good product but there is room for improvement especially with customer support. Hi Edgar, our design team has already taken up the task of improving user experience. You should see the changes over the coming weeks. If there are specific hurdles you'd like us to address, please reach out to us at support@callhub.io. Pros: Once it has the contacts in it, it is pretty easy to use. And the speed with which it gets the message out is great. Cons: All of our contacts are stored by a unit or apt number. need to have a field added that would allow us to do that. Overall: This has helped us tremendously with our communications in our community. When we have an issue we need to notify people about quickly, this does the job. Pros: CallHub has a tremendous number of features, but in my case I just needed an easy to use, economical SMS text broadcast service. CallHub meets my needs perfectly, yet allows me to add features in the future. The orientation information/videos are very helpful. Cons: There were a few topics that the orientation did not cover but are basic to text services. Nonetheless, I had to contact support to confirm. Example is how to opt out of messages. Overall: CallHub support quickly answered questions. Although we have just started using CallHub, it appears to efficient and more cost effective than our previous texting service. Hi Mike, thank you for your feedback. Please reach out to us at support@callhub.io for specific information you'd like to see during the orientation. We'd be more than happy to create content that helps you get the most out of the SMS broadcast service. Pros: CallHub has been investing in a better user experience and we've noticed. 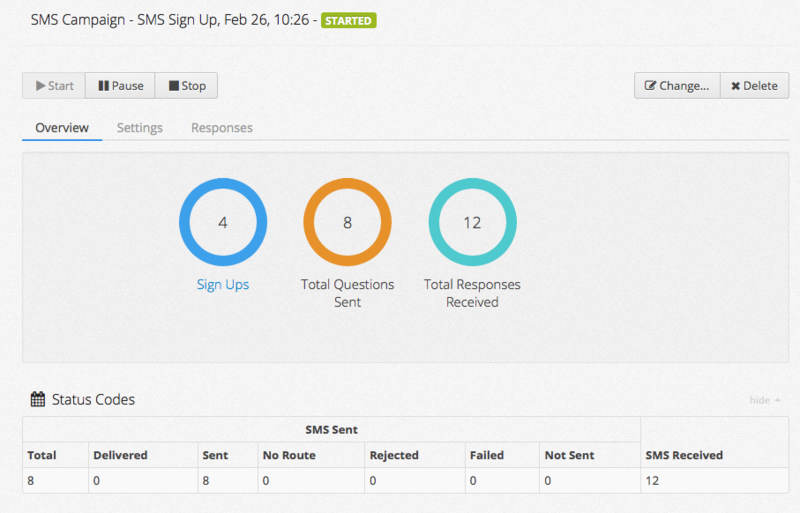 It's been pretty easy for us to quickly send sms campaigns around product announcements and other important updates. Email alone doesn't cut it anymore, so an SMS option is important. CallHub is a very inexpensive option for us to do this outreach. Cons: Each time we send a campaign, we are having to pull our list from our CRM and upload to CallHub, as our list is constantly evolving, and we don't have an integration. Removing that step would bring so much more simplicity to this task, and help us to communicate more frequently through sms. Pros: Great features for call centers! You have the option to select call center mode, manual dial mode, text messaging and they integrate easily with your CRM of choice. Cons: The dashboard is a little dated in appearance. Pros: I love that it integrates with Salesforce. Adds another layer of follow-up with targeting outreach to your efforts. Cons: Some features seem to have glitches but customer services says they are working out a few bugs. Hope they do. Pros: The ability to connect multiple volunteers to a single project and have separate tasks assigned to them. Cons: The software does not comply with my network's specific structure and. Cons: Rutchel in customer service is horrific. Customer service in general is poor. Overall: CallHub is good because you can scale up-and-down quickly because there are no agent seat fees. However, the software is not stable and customer service is poor. It took weeks for us to convince our customer service agent that they were way overbilling us. If you have a very simple calling campaign, and need to train agents, their UI is simple. Watch the call logs for billing inaccuracies. This is a fantastic piece of software. You can accomplish so much as one person in so little time! Pros: Ease of use particularly on the user side. Just point and click. It tracks the conversations for you and notifies you when you have response. Cons: Deleted a record in the middle of using it and the system would not move forward from there. My understanding is they are now working on fix which will be done shortly. Pros: Nationbuilder integration is awesome, particularly for SMS and for making calls to recruit volunteers. The development team is very responsive to questions and feature requests, too. Cons: Some parts of the interface seem a bit buggy (like downloading call campaign reports, and having nationbuilder surveys in call campaigns) and there's currently no predictive dialer feature. Also the voice broadcast IVR feature could use an upgrade to let you program more than two options. Overall: Overall good. Great to be able to work so closely with the dev team and have them be so responsive to feature requests and bug reports. We were able to end up with the product we needed. Thank you for the review! 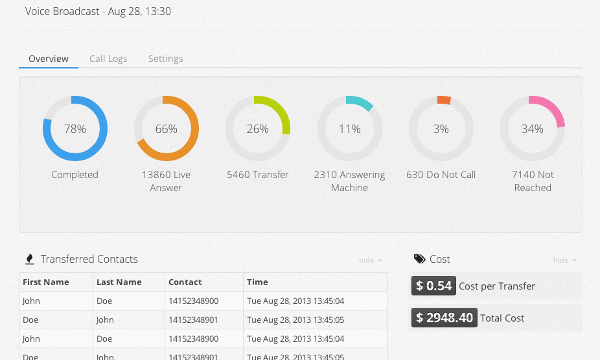 Our predictive dialer is currently in the works and we've ironed out the kinks that you mentioned. Pros: I've only used the Collective Texting part of Callhub. Features there surpass most of the competition. Cons: When dealing with large datasets we had many instances where the data from our conversations was not retrievable from Callhub. It took many hours of our data teams time trying to cobble together partial reports into a cohesive picture of our campaign's texting efforts. Very easy to get up and running! Great experience. Pros: I like the value that we get and the ease of starting a new campaign. Cons: Many of our volunteers seem to have difficulty calling through their laptops. Most end up calling through their phones instead. Overall: We've successfully made hundreds of calls. Some of our volunteers have been intimidated by the software, but others jumped right in. Dropping messages on voicemails has been relatively easy. Recommendations to other buyers: Editing a campaign seems to be difficult. Also, setting the phone number for a campaign seems to be faulty. My account has two numbers. I believe that the phone set was the first number added to the account rather than the number designated for the campaign. Thank you for the in depth review Peter! The feedback and advice is really appreciated. We're working on them and they should be implemented very soon. Overall: This program was great for our company generating revenue. We used it to call store locations to ship us merchandise that was expected. Overall: I was able to have my volunteers who are located all over the city, assist when they could from the ease of their own homes, saving them 4 hours in travel time. Pros: Voicemail Drop- save time by leaving a pre-recorded voicemail! Auto-dial- save time by letting the computer dial for you! Link to nationbuilder- RSVP to events, answer surveys, and import contacts lists! Cons: Sometimes glitchy, sometimes sound quality is not the best. Overall: We can make calls at about 5x the rate that we would with a manual dialer, getting through a list of 100 calls in just over an hour. This has been a huge capacity saver in our organization. Pros: Its a nice, simple and effective tool for phone banking. They have made this marketing a useful and affordable. Cons: Seems everything great more options for the dailer with the excel sheets and frequent updates and improvements required. Pros: It actually replaces many operators and the mass texting options is the one which attracts me and in love with. Cons: As such I don't see any disadvantages here and one should keep updating and upgrading the software to latest trends. Pros: It is simple to get up and going. The system integrates well with a lot of CRMs. Price is on point. 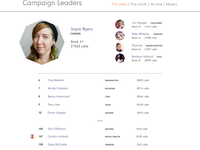 Overall: I have used CallHub for multiple campaigns it is an easy way to get your message out. Pros: I like that it is easy to use the site. It is user-friendly, and the customer support is great. They respond to your question fast. Cons: What I like least about this service is that I find it hard to upload contacts sometimes. otherwise the service is great! Hi Derison, can you send in a support request to support@callhub.io with the specific problem you're facing with uploading contacts? We'd be happy to help you sort this out. Pros: The pay per use model, meaning no need to pay a monthly or yearly membership fee to use it. I also liked that you only pay for what is sent. Not for what is not sent. I like the ease of use also, meaning, the writing of the message was very intuitive. The importing contacts was fairly easy. creating a phone book, was good. Cons: I did not like the scheduling feature. I watched all of the videos and user blog, and no one offers a clear explanation of how the scheduling of a SMS text campaign works. I spent too much time in trial and error. ALL the errors must be published on the blog also. Overall: I liked it overall, specially the price model. I think you can improve on the customer service trouble shooting part. Specially in peak times of use. You can expand on your FAQ, and blogs. Expand on your videos, and make it so that you guarantee a chat troubleshooting response within 6 hours. You should offer two types of chats, one for account set up questions and another for technical questions. Pros: I am really pleased with CallHub and greatly find their outreach tools very useful. Cons: I would greatly appreciate some more promo. Hi John, thanks for your feedback. I'll pass these along as feature requests to our product team! Cons: I do not like that text are not sent and I am charge for it. It has bad business consequences when I have to tell customers that I have communicated changes to them regarding scheduling. Overall: There has been 2 occasion where I send mass SMS and receivers didn't get me text but my account was charged. I have used the application occasional since then after customer service told me that the system doesn't charge for unsent text. Perhaps the system saw it as sent but receivers didn't receive it. Recommendations to other buyers: I have noticed some charges and update to the software but I haven't had a chance to you after those improvements. Hi Clinton, Thanks for your feedback. We are sorry about the SMS delivery issues. Our telecom carriers reported the messages as sent. We've since upgraded our carrier and routes, therefore you should not see this issue anymore. Pros: Call-Hub is simply amazing in terms of global coverage, reliability and customer support. Cons: In general, there is no drawback as such for the software. Better rates would be greatly appreciated. Promising SW that fails to deliver. Pros: Has some great capabilities in theory but the software is far too buggy to be used in a production environment. Cons: The SW has a lot of bugs that unfortunately made it impossible for our sales team to use. We received lackluster customer support throughout the whole process and so we decided to call it a day on our CallHub experiment. Pros: CallHub makes it easy to call hundreds of people every hour because it does leave it to the user to dial the number. The phone you're calling from is also hidden which is a handy privacy feature. The service makes it easy to make calls from home while working on another task and only taking the time to mark those who don't pick up as not home or to talk to the few who do. Cons: The software was VERY loud when the phone was plugged into headphone and it could not be turned down. The line was also weak so when people who were called picked up they often couldn't hear. Another difficulty was the marked caller information. After every call that was not picked up, the caller had to be marked "Not Home". However, the software usually had a blue pop up that would say the caller disposition anyway, thus the purpose of having to mannially fill it out fails me. Overall: CallHub was useful for political phone banking and made it easy to call many people at once. However, due to the software's novelty, it was often in obvien info and difficult to use. Comments: Overall good I have a friend that uses it on his call center. Cons: I love the unlimited plan because I want to focus on making money not how much money have I already used. Pros: We use this program for manual collective calling to capture responses on screen which helps us to build our database and it works very well. Has simplified the process immensely! Pros: It is easy to set up, compatible with nationbuilder and your customer service is helpful, effective and friendly. Cons: Making the phone numbers work, with european numbers. And finding out how to make a phoning campaign. Maybe a more basic "how to" guide, when you don't know nothing about the system. Thanks for your feedback Stella. You can check out our how-to page (https://help.callhub.io/page/how-to) for guides to get started. If there are topics we missed out on, please send us an email at support@callhub.io with the topics you'd like to see covered and we'll make sure to add them to our How-To's. Comments: Excellent app for phone banking. Such a powerful app and a really simple user interface. Customer support is lightning quick and they're very responsive. Can't recommend CallHub highly enough.